Abri de Raymonden, Chancelade, was discovered in 1876 by M. Hardy, who also started the excavation work. The Raymonden deposits contained a multitude of stone and bone artefacts from the Magdalenian including numerous art works such as the famous bison hunt pendant. The skeleton of 'Chancelade Man' was discovered on 1st October, 1888 below the floor of the rock shelter, resting on bedrock. After years of studying casts of the skeleton's skull as well as carrying out detailed anthropometric surveys, Ms Élisabeth Daynès has created a silicone reconstruction of what the man would have looked like. The result is a grey and balding looking man with blue eyes and wrinkled skin. He is estimated to have been between 55 and 65 years old at death. 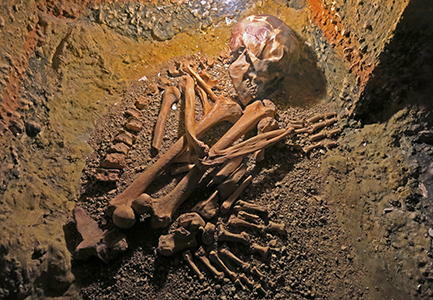 A tomb at the base of the succession contained a human skeleton, Chancelade Man. This find differs considerably from the Cro-Magnon Man. The skeleton was resting on its left side and the knees were drawn up to the torso. The left hand was covered by the skull, and the right hand touched the chin. The corpse must have been sprinkled with red iron oxide powder (ochre), because the bones are stained red. 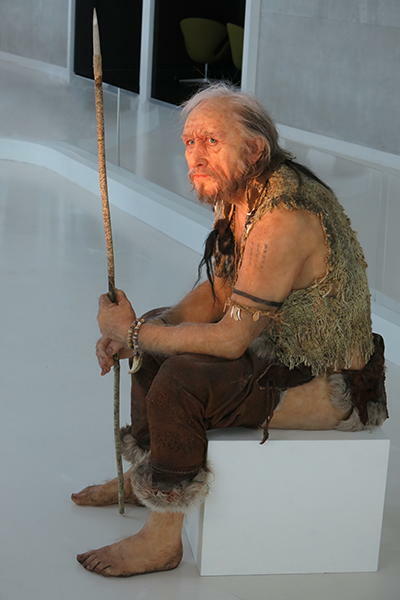 This species of homo sapiens sapiens is now kept in the Musée du Périgord. The Chancelade Man was 35 to 40 years old. He possessed quite long arms and spread-out toes. The volume of the brain reached 1675 cubic centimetres, which is more than average. He must have suffered from chronic rheumatism. The right half of the skull had undergone several lesions that later had healed over again. The man had been intentionally buried and liberally coated with yellow ochre. 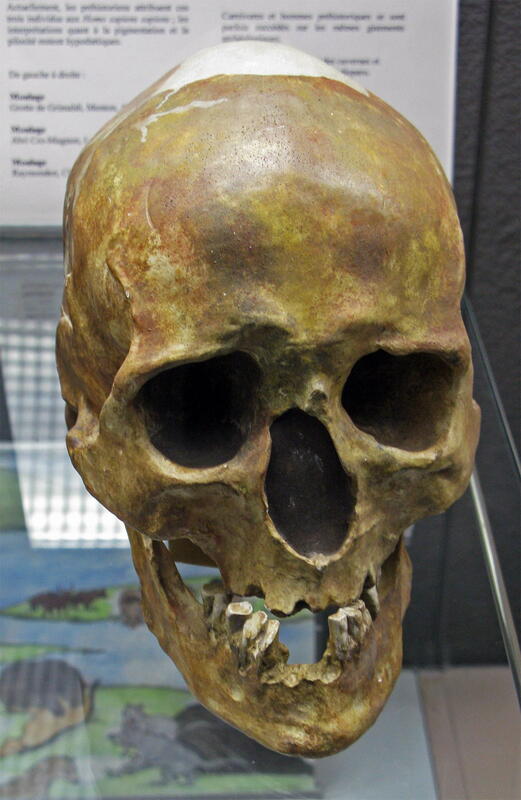 The skeleton was found in a flexed position with the knees bent up to the chin, similar to other stone age finds. 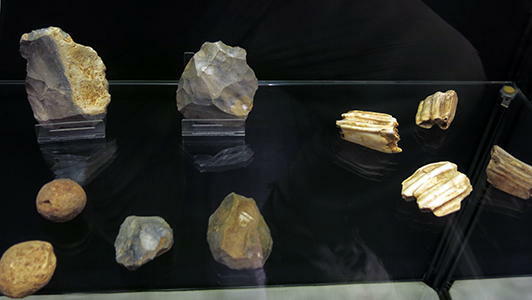 The grave also contained Magdalenian tools, dating from 17 000 to 12 000 years BP. The cranium was rather narrow, but long and tall, and with a clear sagittal keel along the suture between the parietal bones. The face was large, both wide and high , with high orbits quite close together and and of somewhat rectangular shape. The cheek-bones were also quite prominent, high and broad at the same time. The nasal opening was tall but narrow, and the nasal bone (now lost on the original Chancelade skull), indicate a pronounced nasal bridge and large nose, similar to that found in some European and Middle Eastern people. The chin was well developed and the limb bones were strong. The original skeleton is today housed in the Musée d'art et d'archéologie du Périgord in Perigueux. The tools tied the Chancalade skeleton to the Magdalenian culture. 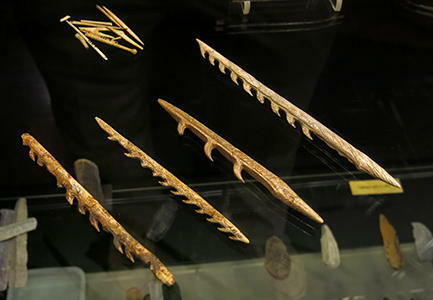 This culture was known for their finely worked tools and ornaments from animal teeth and snail shells. They were also thought responsible for much of the amazing cave paintings found in Europe. Source: Facsimile, Musée d'Aquitaine, Bordeaux. 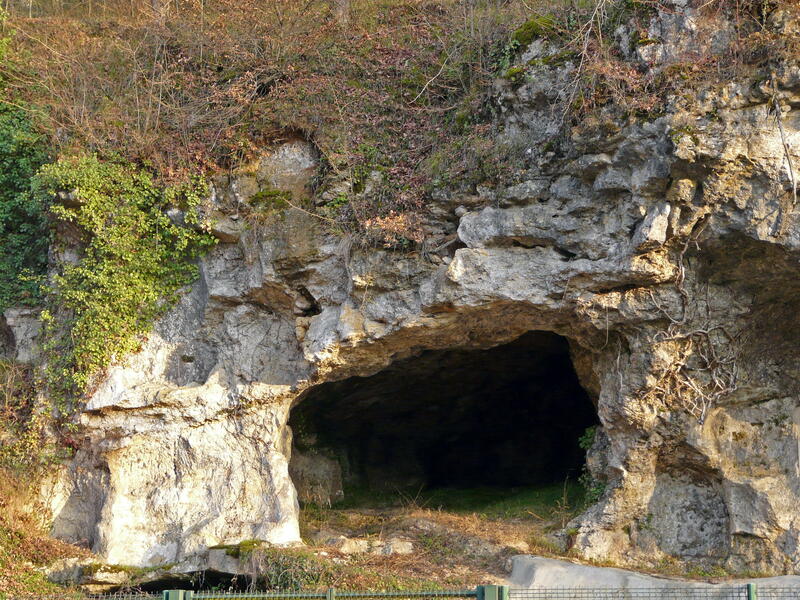 The Raymonden cave occurs about one kilometre north of Chancelade on the left bank of the Beauronne river, a right-hand tributary of the Isle river. Just north of the cave the Beauronne starts to meander forming a first loop which is accompanied on its left side by a steep, rocky ledge. The rocks are composed of flat-lying Angoumian limestones, a local formation of the Turonian. The Angoumian used to be extensively quarried for building stones, and an enclosed resistant layer was mined for mill stones. The entry to the cave is hemmed in between two quarries, not far from the borough of les Grèzes. In front of the cave passes the D 939 from Périgueux to Brantôme, a major trunk road. The prehistoric site was discovered in 1876 by M. Hardy, who also started the excavation work. He was followed in 1883 by two college teachers from Périgueux. During the construction of the railway line from Périgueux to Brantôme the deposits in front of the cave (including many stone and bone artefacts) were erroneously used as gravel for the track foundations and consequently spread out over nearly a kilometer ! After this vandalism with irreparable damage Hardy and M. Féaux started a systematic study of the site which lasted till 1888. Their endeavours were crowned by success because at the base of the archeological layer they found a tomb with human remains. In 1927 L. Didon excavated a section in front of Raymonden cave, which was subjected to occasional flooding. After his death the work was continued by J. B. Bouyssonie from 1928 till 1929. The damage done to the cave deposits by the railway workers seriously disturbed the original succession. Despite this considerable drawback in 1891 Hardy was still able to distinguish four ash layers within the 1.35 meter thick archeological succession; the individual ash layers were separated by thin sandy and clayey levels. 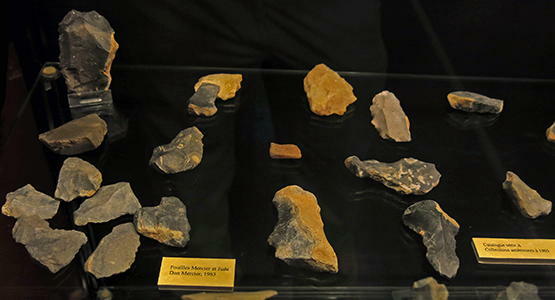 The recovered artefacts were then brought to the Musée du Périgord in Périgueux but regrettably their exact position within the succession was never recorded. Even so certain characteristic finds clearly indicate the cultural epochs Magdalenian IV to Magdalenian VI. The excavations in front of the cave by Didon and Bouyssonie also distinguished four layers, but they were older and had to be attributed to the Magdalenian I – III. 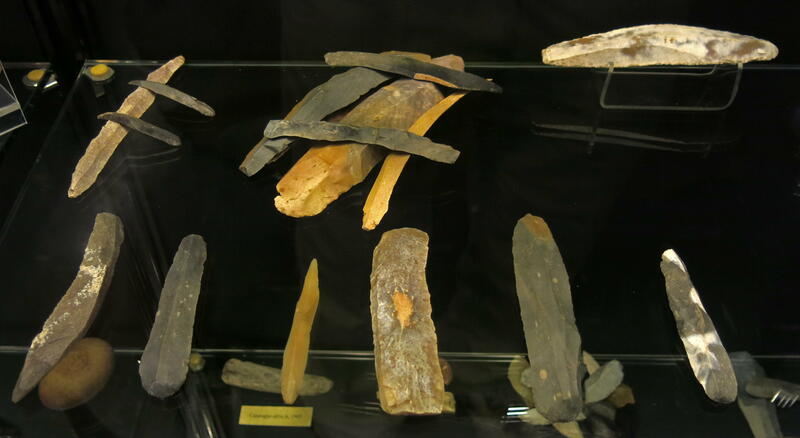 Raymonden was thus the only archeological site in the Périgord that once contained the entire Magdalenian section. The Raymonden cave contained a multitude of stone and bone artefacts from the Magdalenian including numerous art works' such as the bison plate (in French plaquette au bison). The Magdalenian I was mainly composed of draw knives but showed hardly any real knife blades. 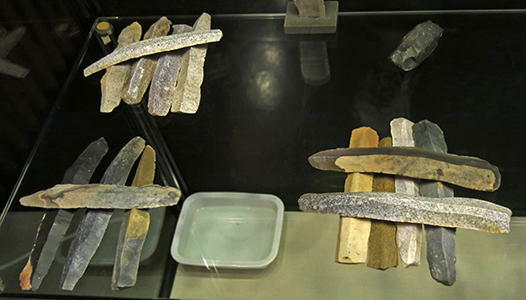 The Magdalenian II was very rich in knife blades, followed by scrapers and burins in equal proportion. The Magdalenian III is clearly dominated by burins. The bone artefacts mainly originated from reindeer. During the Magdalenian II the saiga antelope appeared. Remarkable is the discovery of seal bones within the Magdalenian VI ! This piece is known as 'The Bison hunters of Raymonden'. Guthrie (2005) describes it as a Palaeolithic butchering scene on a pendant, the broken hole to the far left, engraved on a thin piece of long bone. The ribs and lower legs are lying to the left. The bison has been 'boned out' by about seven people, leaving behind the heavy bones and head, taking mainly fat, viscera, and muscle. When a kill is made near camp, much of the carcass is brought back, but a kill many kilometres away, involving lots of packing, means that time spent processing on-site pays off in lightening the load. For the hunters, this was a happy scene. This engraving may be of a crustacean. Rod engraved with a frieze of reindeer. Harpoons, eyed needles, and what may be a clothes pin for holding a garment together. The harpoons are all single sided. The two top harpoons have well made conical bases, which have been engraved with many grooves, presumably to make attachment to the matching socket on the spear shaft more secure. Huge numbers of blades were made in this culture. 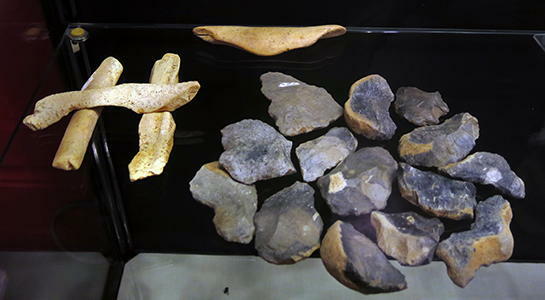 They were the raw material for not just knives, but scrapers, burins, and other tools. Some of these blades have been turned into scrapers, chisels and burins. These scrapers have been very well made. Image of a horse engraved on a rod. Two spear straighteners. 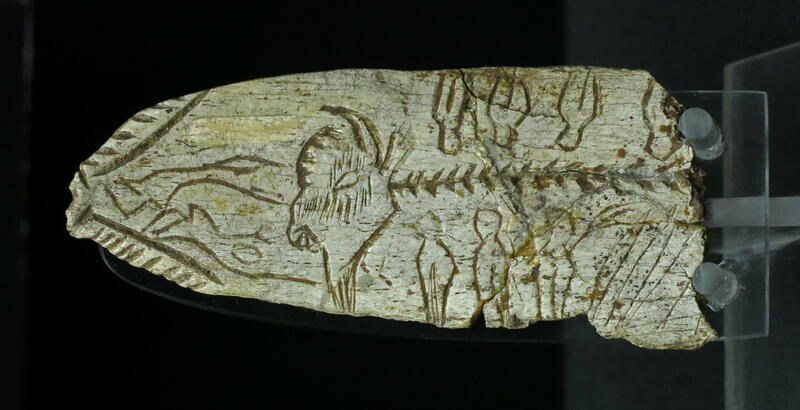 the upper straightener has a cervid head engraved on it, as well as a tail which looks remarkably like a whale's tail. 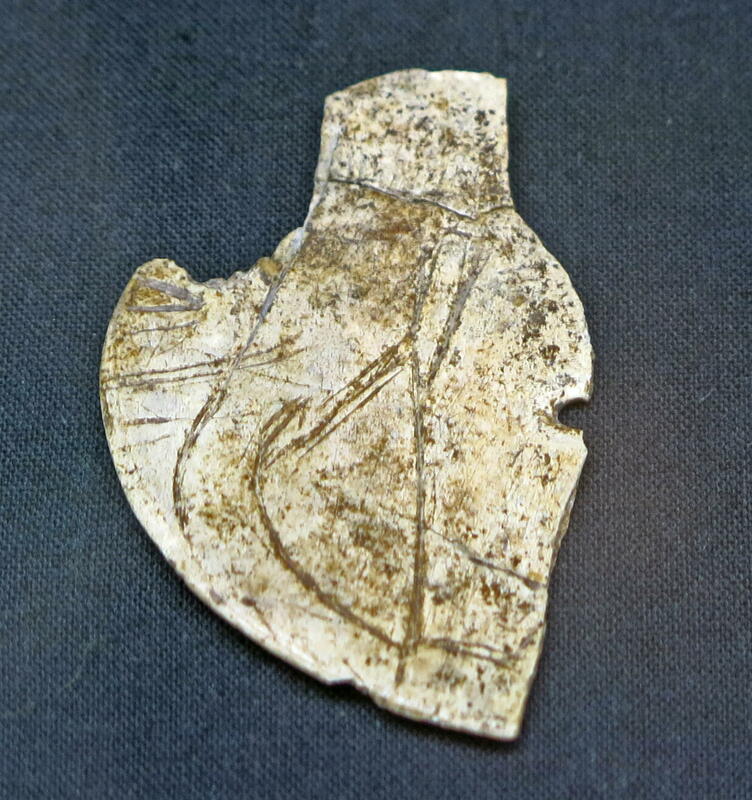 The lower tool has an unidentified animal with long hair (or feathers) engraved. It looks like some sort of eagle. The carving is listed as a penguin on the label accompanying the display. However it is difficult to see the outline of a Great Auk, Alca impennis (the only northern hemisphere penguin of the time, now extinct), in the image on the spear straightener. The sculpture in low relief shows only one figure of a bird, discovered at Raymonden, which M. Hardy would have us believe is a representation of Alca impennis. But the truth is that the bird engraved by the Magdalenian sculptor bears little relation to Alca impennis and another interpretation must be sought, perhaps in the same family, if the shape of the tail, the position and relationship of the feet, the elongated body, the upper appendages which can be taken as embryonic wings, have all to be taken into consideration. As for the head, with its enormous hooked beak, that has no parallel in any bird. The Raymonden figure resembles neither the Great Auk nor another bird of the same family; it seems more like a raptor with wings folded. Fragment of a rondelle, a flat circular object usually with a hole in the centre, as here. Often cut from a shoulder blade. This one has a mammoth engraved, showing the trunk, one tusk, the mouth, the head, the eye, the shoulders and front leg. A little further north of l'abri Raynonden is a smaller abri, Raymonden Nord , sometimes called la Grotte de Chancelade. 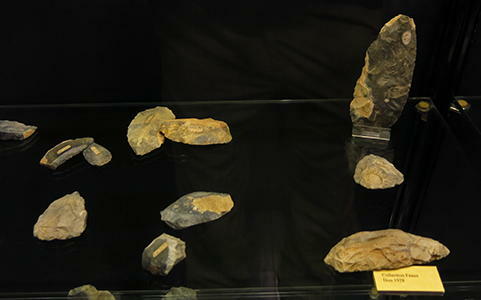 It contains artifacts from the Mousterian Acheulean tradition (MTA type), from the Lower Perigordian, and from the Aurignacian. It was discovered in 1874 by M. Féaux. Tools from Raymonden nord, including three hand axes. Alcalde del Rio H., Breuil H., Sierra L., 1912: Les cavernes dole region Cantabrique, Monaco: Imprimerie Chene. Hardy M., 1891: La station quaternaire de Raymonden a Chancelade (Dordogne), et la sepulture d'un chasseur de rennes, Paris: Ernest Leroux.